This entry was posted on Thursday, April 30th, 2009 at 9:44 am	and is filed under Farmed Seafood / Aquaculture / Raised, Worthy Efforts. You can follow any responses to this entry through the RSS 2.0 feed. You can leave a response, or trackback from your own site. Gosh, knocking open ocean aquaculture as social, economically and environmentally unsound is the type of thinking that stymies all progress. We, in any aspect of the seafood business, acknowledge we are imperfect. Nothing is perfect. But Christina, your uber-criticism throws the baby out with the bath water. 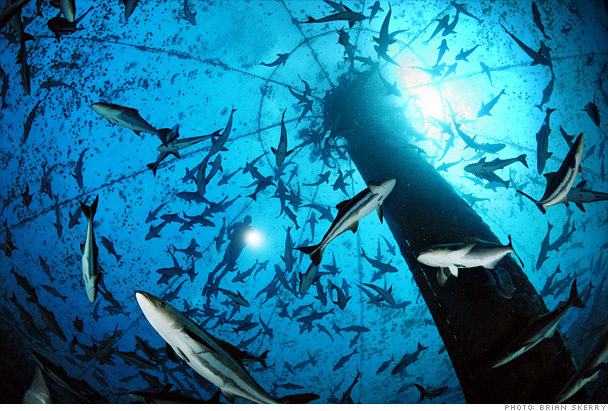 Open ocean aquaculture is PLAN A to deal with a looming global food crisis, of which seafood will be the first casualty. Open ocean aquaculture, or what we at Open Blue Sea Farms call range-free fish farming, is a key part of the solution for sustainably providing our hungry world fresh and healthy, contaminant free seafood; seafood is primary source of protein for over one billion of us human beings. Putting local fisherman out of work? It is local and global fishermen who are depleting our oceans and waters of sea life to begin with. There is precious little fish to catch when it comes to the U.S., because of reckless overfishing and a short term focus on profit and not people and in this case, marine life too. Fisherman are taking from the sea too much life at too quick a pace. Species do not have time needed to reproduce and replenish stock. My gosh, an incredible amount of marine life is either now extinct or endangered. Further, because open ocean aquaculture ‘has legs’, we can not only provide a sustainable supply of nutritious and delicious seafood on a reliable basis while respecting our oceans and their stakeholders, our methodology incorporates (and we totally support) the concept of global localization. That is, we can have range-free fish farms in many, many parts of the world, owned and staffed by local folks, cultivating local seafood, indigenous to their part of the world. And a great added benefit is that the major carbon footprint created by shipping seafood all over the world can be enormously reduced. What this really means is that fellow humans in third world countries, whose fish are gobbled up by seafood companies from major, industrialized, modern countries and sold to U.S. and E.U. markets, are left dying of starvation or severely malnourished, will soon have ways to meet the future alive and healthy. Another thought to consider is that not supporting open ocean aquaculture in the U.S. will have our nation relying on others to feed us, as we rely upon others to fuel us. I’ll wager most Americans believe this is not a safe route to consider or let happen. The genesis, the core, the essence of open ocean range-free aquaculture is to naturally protect our oceans while cultivating healthy, non genetically monitored seafood. Its environmental and social impacts have the promise to be the best sustainable solutions to feeding our world. And it is in its infancy. Snuff us out and we all become liable for a crisis a lot meaner than our current economic situation. We can make it happen and side step a major crisis if we work in a collaborative, non-accusatory manner in the spirit of open communication. And Christina, lest I forget, I mentioned we are Plan A. There is no Plan B. We are investing in our oceans. Jump in and join us and let’s work together. CNN’s VIDEO journalist Richard Lui reports on a high tech, sustainable solution for raising fish.